True story: I have never purchased a succulent for myself. 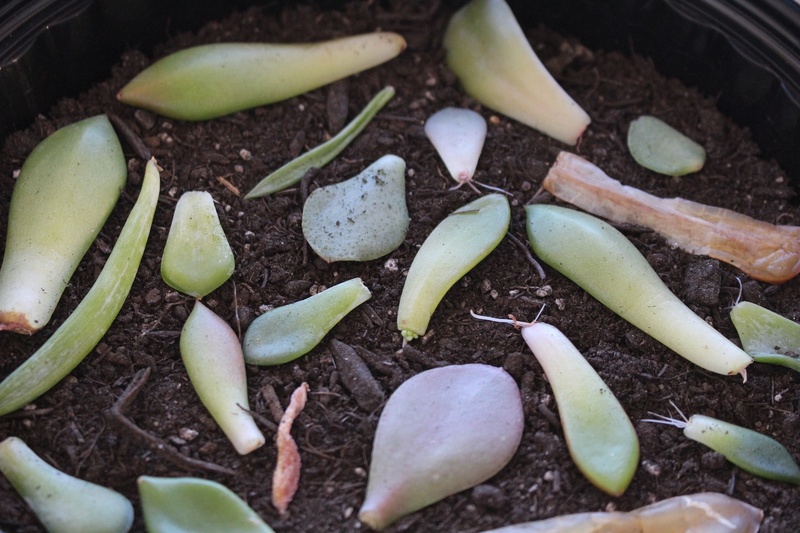 A little over a year ago, my job at the time had 6 or 7 succulents from Trader Joe's on the windowsill. 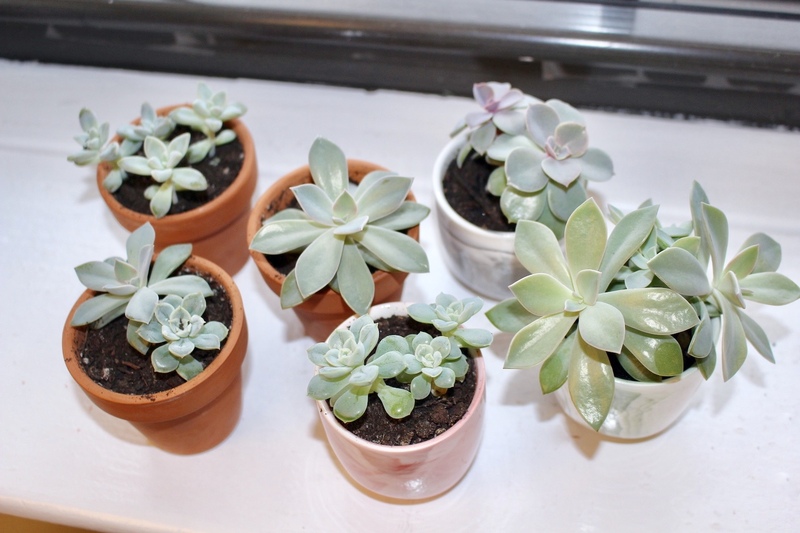 They were getting a few hours of direct sunlight throughout the day, and were thriving (no, really, ridiculously THRIVING). Fast forward to the peak of winter while the heater was all-the-way-cranked on a super cold day in NYC, some of the leaves closest to the radiator burnt. My boss plucked the leaves from the stem and laid them on the soil. A few weeks later, I couldn't believe that I saw roots & a baby succulent growing from the burnt leaf. 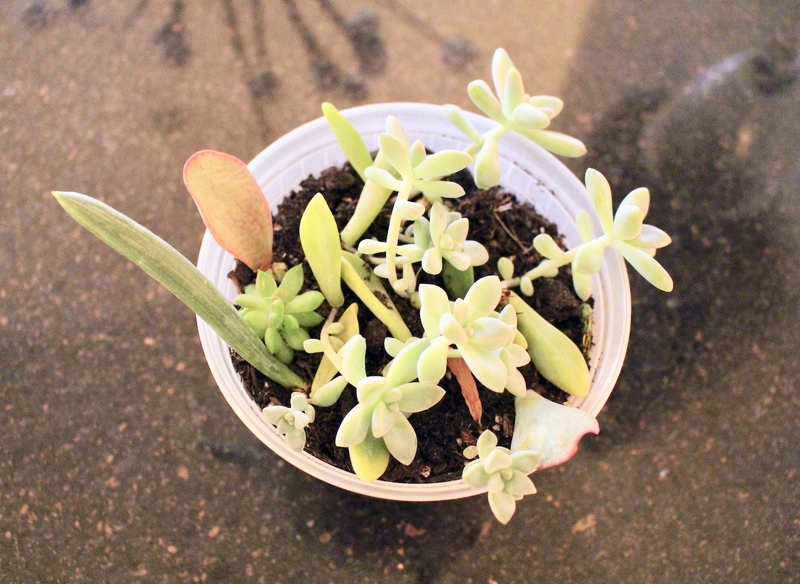 Once the overheated succulents seemed to be in much better condition, I just had to try it myself. 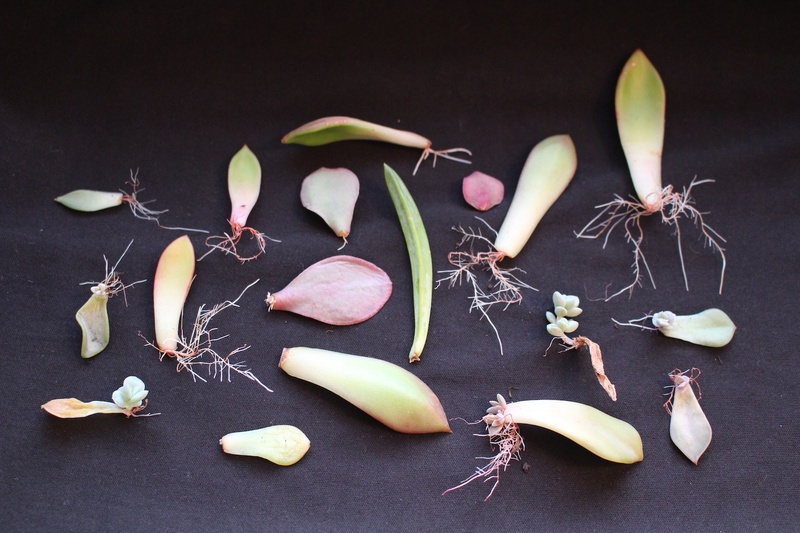 I clipped 10-15 leaves from their stems to propagate on my own, and luckily for you, I documented the entire process. Less than a year later, I went from owning zero succulents to (holy sh*t) 30 babies in the apartment. FULL DISCLOSURE, I am not a certified botanist; all of the information on this page is from personal experience, research, and months of trial and error. 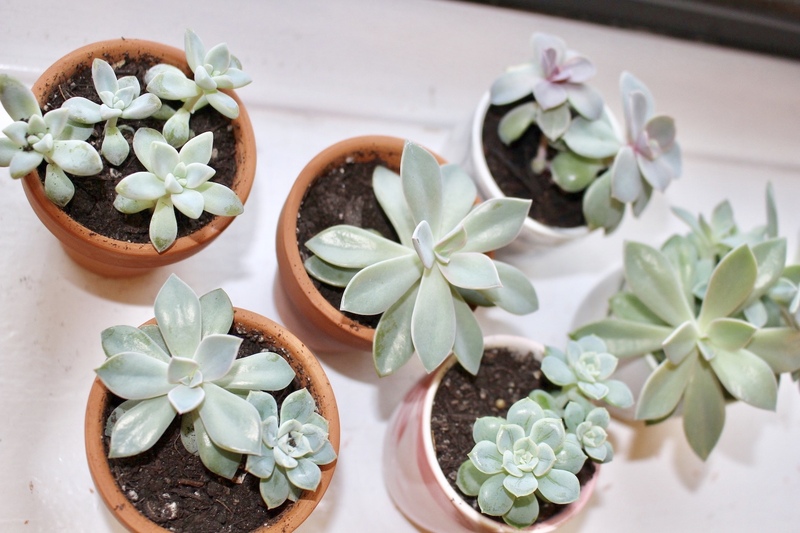 Please keep in mind that not all breeds of succulents are created equally. 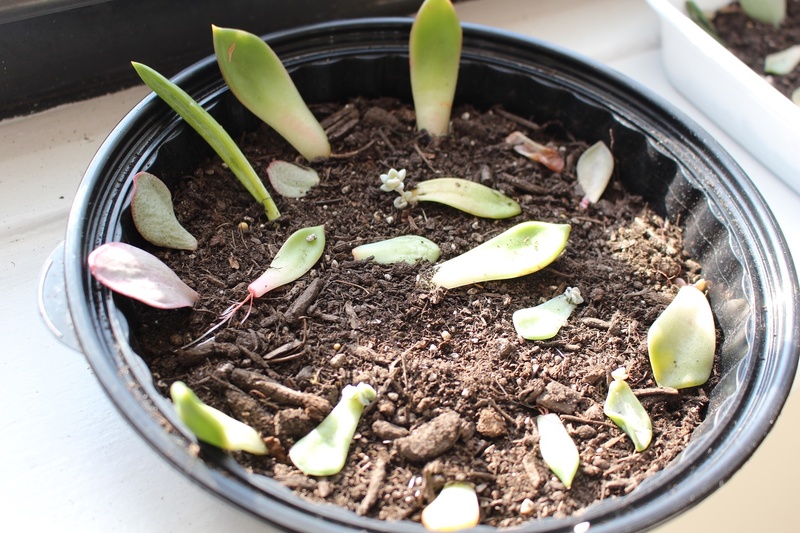 Most will propagate differently (some way slower than others), and some may not propagate at all. Have fun, and lots of patience! 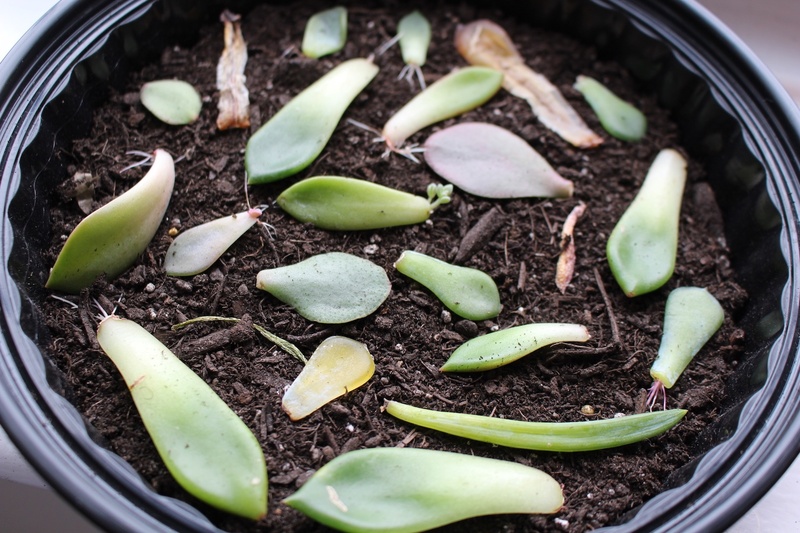 Although leaf removal sounds self explanatory, this first step is extremely important and will likely make or break the chance of survival during propagation. 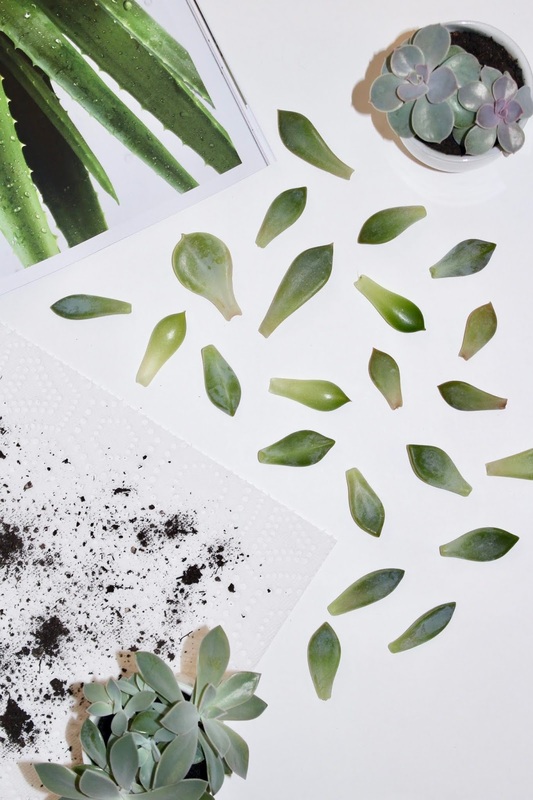 Examine your succulent until you spot a healthy leaf. 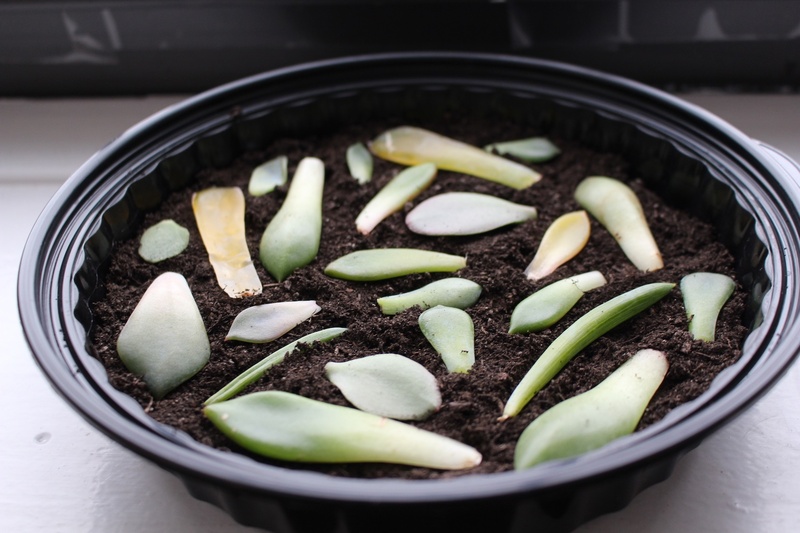 I usually go for the leaves closer to the soil or mid section, avoiding new growth at the top. With clean hands, firmly pinch the leaf as close as possible to the stem. Slowly wiggle left and right until you hear a little 'click' indicating that it has popped off from the stem. A quality cutting means the leaf has not been damaged or ripped in the process of removal. If part of the leaf's base ripped and still attached to the stem, it is likely that the leaf won't be able to grow roots and will not be successful in propagating. However, if part of the stem was removed and attached to the leaf, you're likely to see success! Place your leaves on in a bright area that's out of direct sunlight and allow 5-8 days for the leaf cuttings to dry and callous over. BE PATIENT! I've read that some people usually wait 3-5 days, but I've been most successful waiting up to 2 whole weeks! Don't fret, they will not die from being unexposed to soil or water during this period. In fact, you might even see roots or flower growing from the calloused area early! 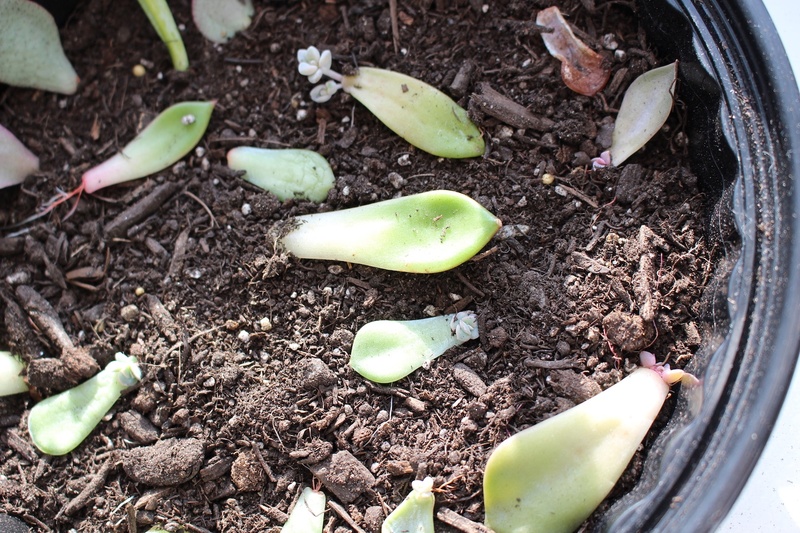 Once you're 110% positive that the ends of your leaves have calloused over, you are ready to begin propagation! 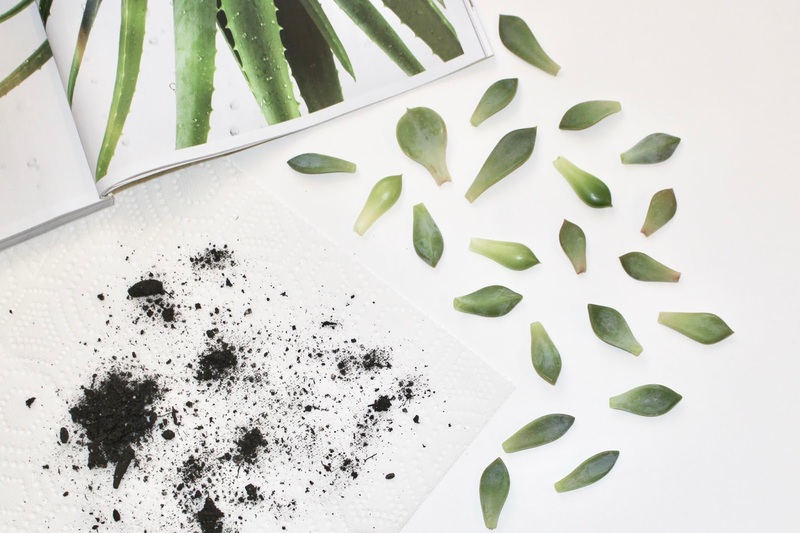 First, you'll need well-draining soil meant for cacti & succulents. I use Cactus Palm and Citrus Potting Mix by Miracle-Gro, but similar brands can be found here and here. Spread about 2-3 inches of soil on top of a shallow dish. No need to get fancy with the dish, I use leftover takeout containers and have done just fine, hahaha! SPRITZ WITH WATER ONCE A WEEK, AND WAIT! PATIENCE. IS. KEY. For the first few months, spritz leaves to dampen the top of the soil once a week with a spray bottle. Once you begin to spot growth (roots or flowers are visible) you may spritz every 3 days, or whenever the top of the soil begins to look dry. Do not touch, move, or overwater the leaves or else they will rot and die — I learned the hard way ;). Once you're feeling confident that your cuttings are thriving, you may transfer them to their own individual pots or a deeper dish/container. Be gentle as you may find that the roots have tangled. Do not bury the "mother leaf" because the new babies rely on it for growth. Again, no need to be fancy — I transferred my second propagation batch to a plastic soup container and noticed crazy growth! 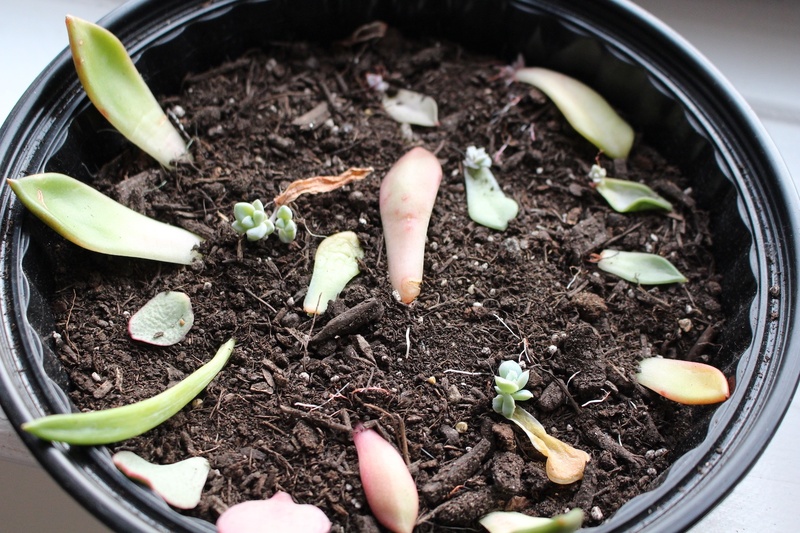 Oddly enough, I found that the baby succulents grew the fastest once transferred to the crowded, deep soup container rather than potted individually on their own. Apparently this method of planting allows them to grow longer roots which leads to a larger plant! The mother leaf will eventually begin to change color, shrivel and die off. It's best not to remove the mother leaf until it starts to look & feel "crispy". 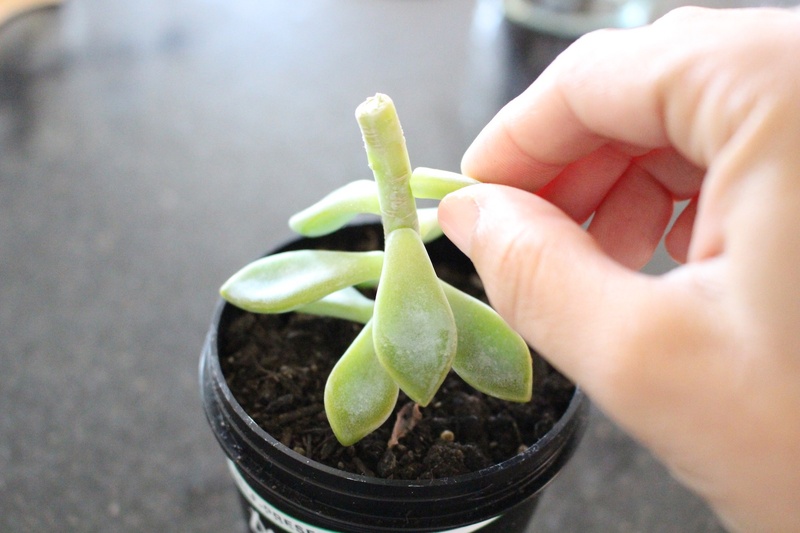 Then you can gently remove it from the base of the baby succulent, the same way you removed the cutting from the stem in the very beginning. Do not remove the mother leaf too early. 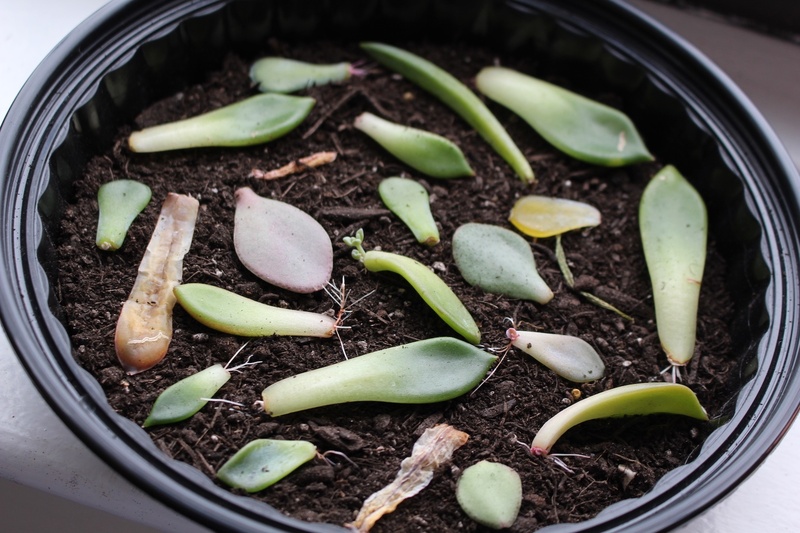 I started watering them once a week about 4 months into propagation, then twice a week during the summer months of July and August. Most of my cuttings from the February 25th photo are now potted in their own little terracotta pots below! Can you believe that I grew them for FREE on my own? 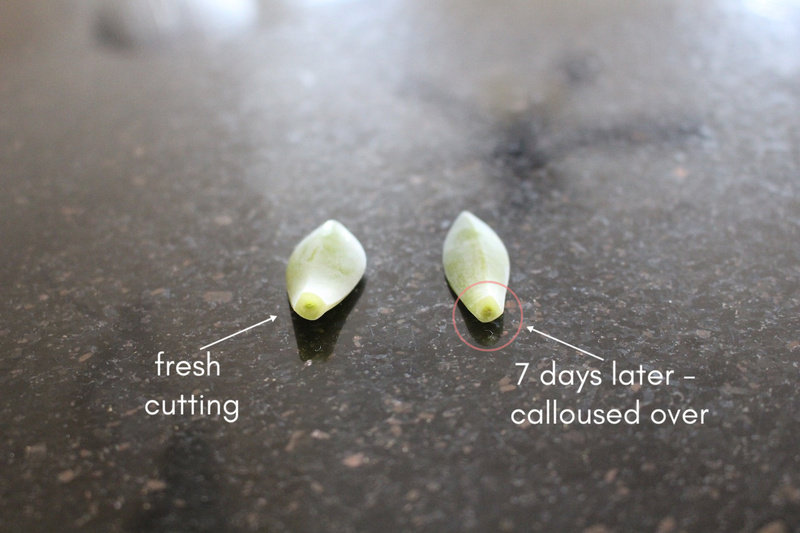 Just a reminder not to get discouraged if your leaf cuttings don't make it. Not every leaf will grow a new plant. I've witnessed some leaves shrivel and die early on, some grow a succulent flower without roots, and others grow roots as long as 4 inches but never grew a flower. If this occurs, that's okay. 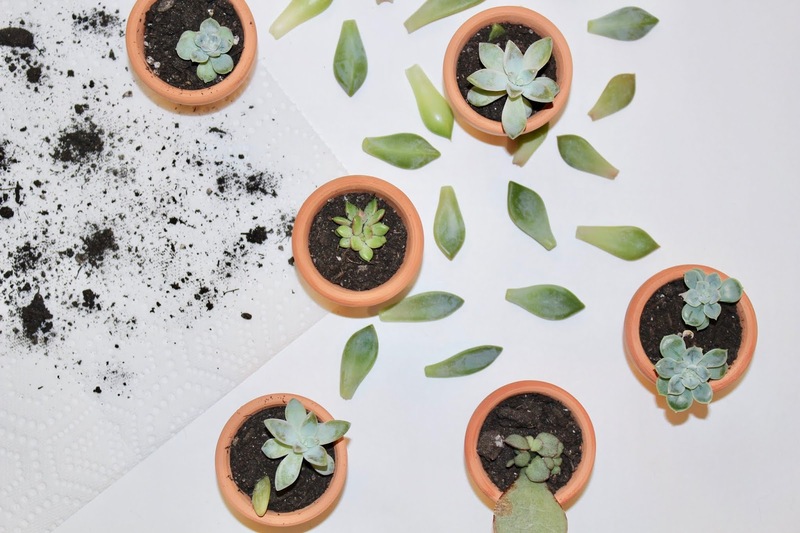 Hopefully this tutorial gives you enough confidence to keep clipping off new leaves and try again -- next thing you know, you'll have 30 little succulents hanging around your house and your significant other ready to chuck them out the window! 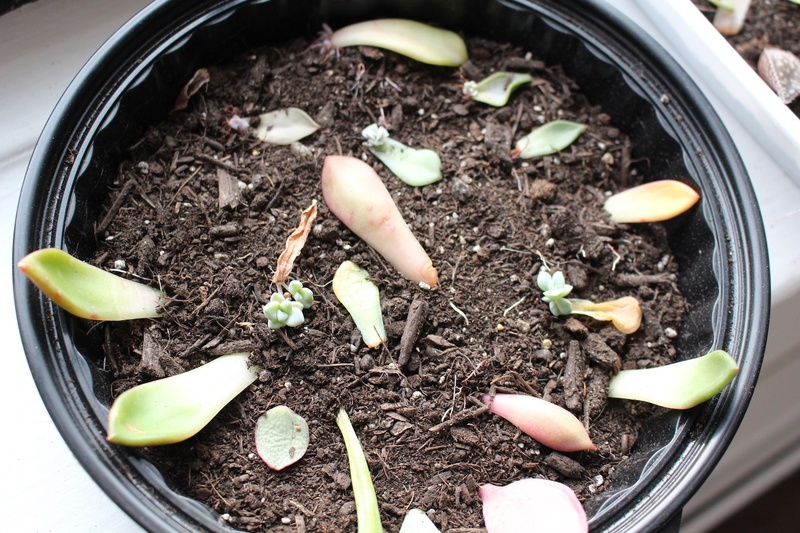 5 comments on "How to Grow New Succulents from Leaf Cuttings"
Such a nice article containning the most useful post. We offer the service of the fast food in Gurgaon. This is a very good article. Thanks for sharing this useful post. I have never seen this type article before. Very good post. having the useful article. Thnaks for sharing.